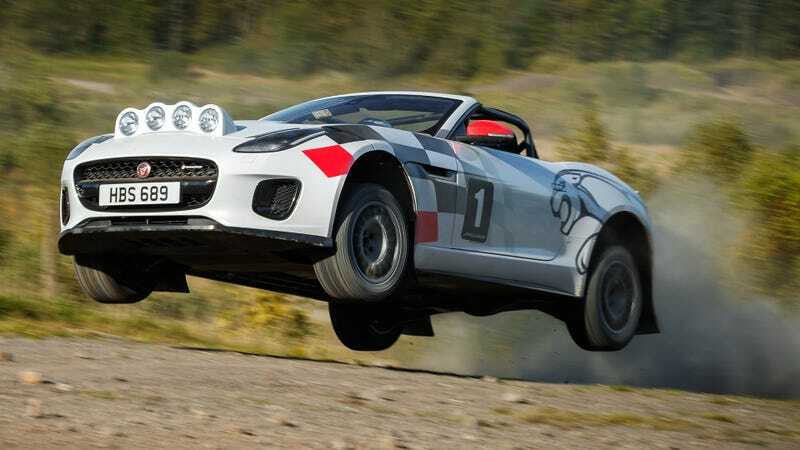 This is a 2.0-liter Jaguar F-Type that’s been caged and rally prepped from the factory. Jaguar claims it’s just a tribute. Seems like a waste not to compete with it, or? Nominally, Jaguar said it built this car to commemorate when the Jaguar XK120 won a couple rallies when that world-beating postwar sports car was new. A 1.5-inch (40mm) lift, per Motor1. Most importantly, a set of rally lights on the hood. That’s in addition to its normal 300 horsepower turbo four-cylinder. Watch this video of the car testing in Wales and you’ll see the driver slow for a kicker, but otherwise rip a jump and some open gravel roads pretty hard. Again, this is supposed to just be a tribute car, but with the FIA’s sports car-friendly R-GT class, leaving it out of competition seems like Jag’s leaving a lot on the table here.